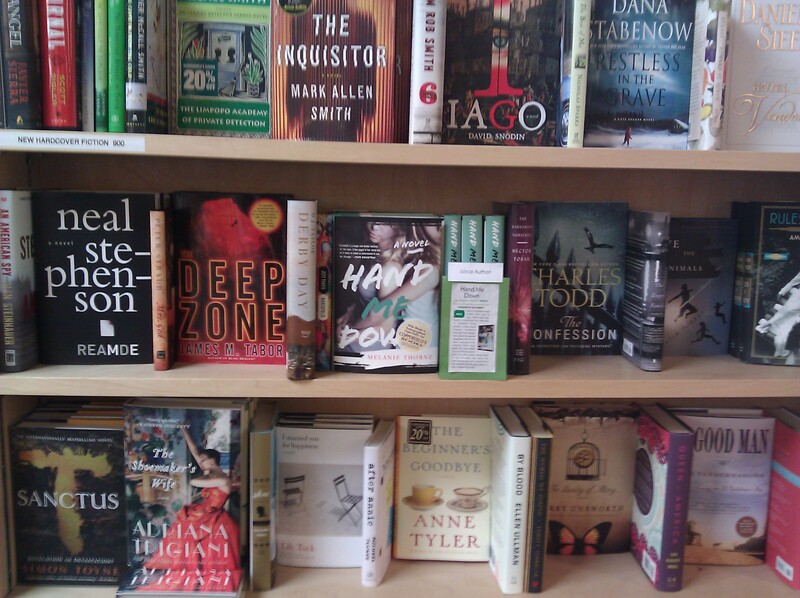 Hand Me Down is Five Months Old, and/or, Win a Free Audiobook! Hand Me Down has been out in the world for five months now. Can you believe it? I can’t. What an adventure releasing this book has been. I hope to share more of the experience with you now that my travels are (almost) over, and I will be posting photos from my readings and outings in some of the places we visited: Portland (waterfalls! greenery! books! ), Seattle (Space Needle from our balcony! ), LA (oh, the palm trees and warm air), Santa Barbara (beach path+dolphins+perfect weather), and more. It’s been a busy five months! I do have one more event, on October 12 at the College of Southern Maryland, with my friend and fellow UCD alum Melinda Moustakis. It will be my only east coast stop on the hardcover tour so if you’re anywhere near DC, I would love to see you! I haven’t been to the east coast in more than fifteen years, and it would be wonderful to have a warm welcome back. Come say hi! In celebration of Hand Me Down‘s five month birthday, I am doing a giveaway! My first-ever giveaway, of the complete audiobook, narrated by Ali Ahn, who has also narrated books by Sarah Dessen and Gary Shteyngart. I know that back-to-school means moms are in the car driving kids to and from school, and teachers are commuting to their classes again, and that also means it’s time for books on tape, or, er, books on iPods! So I thought the audio version of Hand Me Down would be an appropriate prize for a lucky someone. Of course, if you don’t want to wait, you can get the audiobook free with a thirty day free trial membership to Audible.com, a database that would be great for those of you who love to listen to your literature. 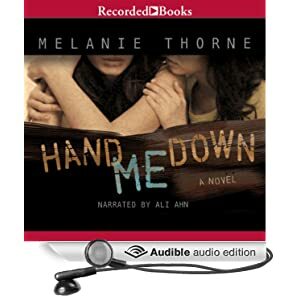 To enter to win a CD set of the audio version of Hand Me Down in my giveaway, all you have to do is leave a comment on this post. You can say anything you want, but I’d love to hear about a book you enjoyed recently. Word of mouth is really the best advertising any book can get, so if a piece of writing really speaks to you, tell you friends, write reviews, and spread the word! If you want an extra entry, you can like me, or, at least pretend to, though my insecure childhood self is crying and asking why you don’t like her for real, but she’ll get over it. The point is, if you like my Facebook page, just tell me in your comment below and I’ll give you two virtual raffle tickets. Easy as that. If you have already liked my Facebook page—which is very much appreciated, thank you, lovely person—then tell me that below, too. Shares and tweets of this giveaway get another entry, and new Twitter followers, too (@mthorneauthor). Just let me know what you’ve done and I’ll put all your tickets in the hat. I’ll do a random drawing after all the comments come in, and the winner will receive a pretty boxed set of audiobook goodness. Deadline for entering your comment is 11:59 pm next Friday, September 21st. So, happy birthday to my little book baby, happy back to school to all the real-life babies who are entering a new year, and happy fall reading whether your book is on tape or not. Hi there! If you haven’t been able to make it to any of my readings, there is now a You Tube video of my Booksmith reading in San Francisco, filmed and posted by Lit Seen. 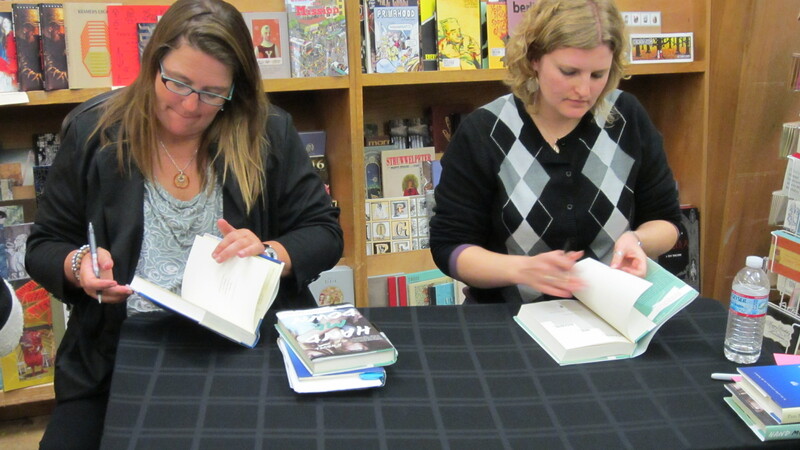 This was the reading I did with Pam Houston, and I asked to go first since she is such a fantastic reader. Really. You can watch her read, too, from her most recent novel, Contents May Have Shifted. I hope to someday be as poised and calm as Pam is when she reads. “Backstage” before the reading, I was trying to contain my nerves, my knee bouncing, my fingers tying themselves in knots, and she had her feet propped up on a box, writing something on her phone, totally nonchalant. I asked if she was nervous and she said she’d done forty readings since I’d seen her last, two months earlier. I don’t know how she does it, but I get a little less nervous every time, so that’s progress, I guess. Anyway, I hope you enjoy the show! 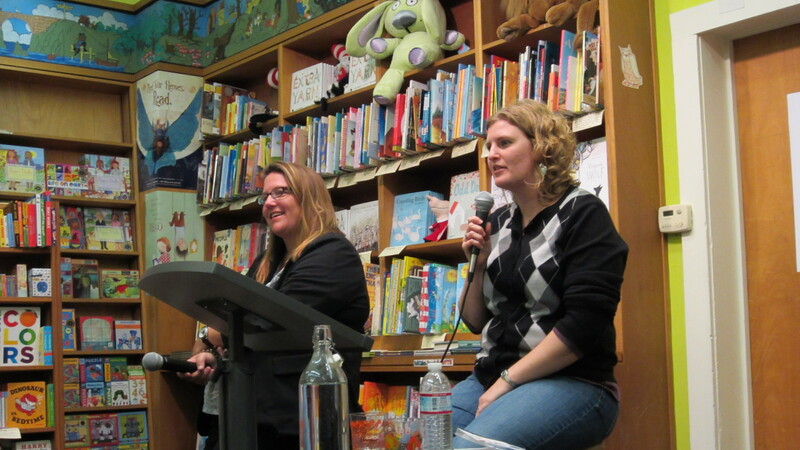 Thanks to Lit Seen for all their support of authors and literary events in the Bay Area, and to the Booksmith for hosting us! I grew up in Sacramento, and part of Hand Me Down takes place in Sacramento, so I’m extra excited to share this event with you: Tuesday, May 1st, at 7 pm I’ll be at the Barnes & Noble in Arden Fair Mall. I hope to see lots and lots of familiar faces at this one! 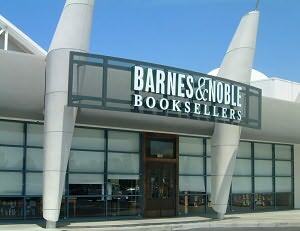 This is the Barnes & Noble I used to drive to at ten o’clock on Friday nights to get my book fix for the weekend. I bought journals that I filled with poems and teenage angst. Sometimes I wandered through the rows and rows of shelves for hours, making lists in my head of all the books I wanted and then narrowing it down until I had a number I could afford. I spent what most college kids spent on booze on piles of novels that I still have. Other authors have told me that at their hometown events they’ve seen past teachers, classmates, neighbors, even dentists or hairstylists, or surprising other blasts from the past and I can’t wait to see who shows up here, in my hometown. If we were friends or acquaintances, if we worked together or went to the same school, if we met in softball or choir or at a show or through an ex-boyfriend, if we knew each other at all, I hope you’ll come say hello! If we don’t know each other yet, come introduce yourself! I’m friendly. My students often write “approachable” in their evaluations. The point is, come celebrate my first event in the city where I was born and (mostly) raised. I’m sure to be at my best with the home court advantage and all. Event with Pam Houston Booked! I’m so excited to share this most recently confirmed event with you: a reading with Pam Houston! As I mentioned before, Pam is one of my all-time favorite authors, and I am honestly so thrilled for her new book, Contents May have Shifted, which comes out in early February. In addition to being an amazing writer, Pam is also a kind and generous person and one of the best teachers I’ve ever had. I was lucky enough to work with her at UC Davis for several years and she was the chair of my graduate thesis committee, which advised me on the very first draft of Hand Me Down, though it was originally titled something less interesting that no one liked. Anyway, a dream event has been scheduled with Pam at the Booksmith in San Francisco for April 18th, and I hope you can make it! Maybe I’ll tell the story of how I met Pam as an undergrad before I’d read any of her books and said something stupid and naive that she was gracious enough not to laugh at. Then I read Waltzing the Cat and was tongue-tied around her for years like she was a rock star, and in my world, she totally is. Check out Pam’s site for more of her events, and look for an events tab on my site coming soon! Yay! Another book event has been confirmed! The launch event for Hand Me Down will be at Copperfield’s bookstore in Petaluma on the day the book officially hits shelves, April 12th. I love Copperfield’s. I’m so excited to have the release event in a fantastic bookstore filled with light and good vibes and employees who really love books. I spend so much money every time I go, I have to limit my visits. I’ll keep you posted as we get closer. I hope you’ll join me for the event and spend some of your money on good books from a great source, including a signed copy of Hand Me Down fresh off the presses. My first author event is officially scheduled! April 24th, 2012 I’ll be reading with fabulous author of soon-to-be-released The Hunter, and 20 other novels, and generally nice guy John Lescroart at Book Passage in Corte Madera. I don’t expect anyone other than me to put this on their calendar yet, but I’m excited! I’ll get an events page up on this site when I have more than one event to share. Stay tuned!